This image covers a part of the constellation Orion, just a few arcminutes north - northwest from the 1.7 mag. star Alnilam (ε Orionis). 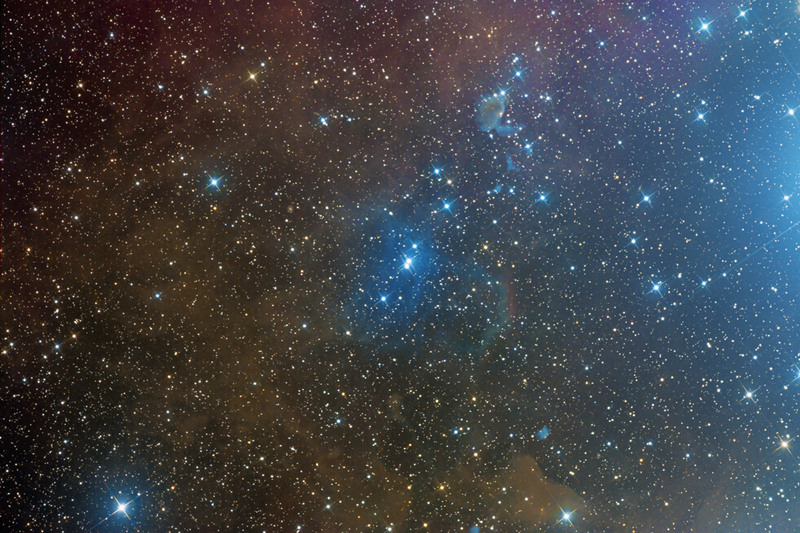 Centered on the reflection nebula VdB 48, the image shows some other reflection nebulae. Among them is IC 426 (also catalogued as Magakian 112, Ced 55j, DG 61, LBN 203.76-16.35, LBN 921, or V1130 Ori). VdB 48 looks like an elongated cloud in the east-west direction overlapping two stars of spectral type B aligned in the same direction, which give an intense bluish color to the nebula. These stars are HD 37370 and HD 37371. The distance of them, derived from the determination of the parallax, is about 740 light-years, which places them in the Alnilam region, which could well compete with the other stars in lighting the gas of the nebula. There is another object on this image (please see the annotated mouseover). It looks like a planetary nebula, partially covered by the VdB 48. Although this object is clearly seen on DSS plates (see the image below), we couldn't find it catalogued in any catalogue.